The perseverating continues about whether to `compromise´and allow some whaling in exchange for countries like Iceland, Norway and Japan agreeing to slaughter fewer whales in fewer places. Even some major environmental organizations, including Greenpeace and the World Wildlife Fund, have signed on. As Stephanie Ernst points out, there is a dangerous ethical compromise in acquiescing to the killing of some in exchange for the survival of others. When we make such determinations with humans, we do so (or should do so) in times of great necessity — as when we send people into battle. That decision to send young people into harm’s way is (or should be) made in times of great need. At such times, the sad burden borne by their commanders is at least partially offset by the knowledge that the soldiers´ deaths were necessary. That´s not the case here. The fact that whales are not humans does not (or should not) mean that their deaths can be senseless. These three countries (or actually, an unknown portion of their respective populations) just want to kill whales because it´s something they like to do. That´s not necessity; it´s not even a good reason. When you add to that the fact that these countries have defied the will of the international community for years while deliberately flouting and/or undermining the IWC ban, one has to ask why we should reward this behavior or believe that these countries will keep their word. For me, all this makes the proposed compromise counterproductive and ethically suspect. I therefore rejoice that negotiations have apparently broken down. In their stead, I look forward to a concerted worldwide campaign to pressure these three countries along the same lines as those used to pressure rogue nuclear nations. The pressure to date, while laudable, has not been sufficient. Neither Japan nor Iceland nor Norway are run by unpredictable extremists. They are rather democratic, open nations that value their standing in the international community. 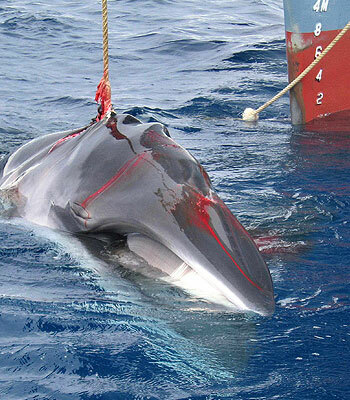 These nations´continued slaughter of cetaceans should endanger that standing. It´s up to the rest of us to make that happen. hogwash. if whales are so precious why did so many nations kill and slaughter them in the 19th century? look in your history books and you will find so many contradictions you will be sick to your stomach. so its the 21st century? what does that mean? humans are humans and will continue to justify everything they do “sacrificing” animals that are in the way. killing whales is terrible but cows, sheep, dogs etc…. are not? hyprocrites.